A Shangri-La paradise, you feel as if you are in a different part of the world. After you see this designer home, you will feel like you are in an enchanted getaway. Stroll through a serene front courtyard, you will then walk through a beautiful artful entrance as you walk on glazed concrete floors, welcomed by huge vaulted ceilings and custom walls. Hand carved doors throughout, custom fireplace and a living room and master that over look an oasis in the back. This backyard is an entertainers dream. 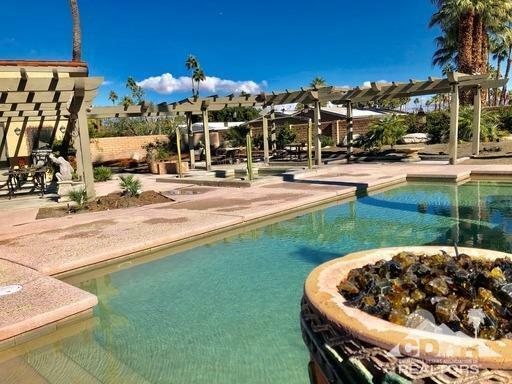 Stone statues, lavish pebble tec pool and spa with art surrounding entire area. Shaded by large Eucalyptus & Malaleuca trees with just enough sun to get that tan. Extravagant water feature and fire put at each end of the pool. If you desire the unique, this is the place for you.